and if any is left I buy food and clothes. Originally the title of this post was The Frugal Reader. It has a nice cadence, but, alas, I don’t have the chutzpah to carry it off. My husband reads my blog. Because I am extravagant when it comes to book acquisition. All the same I like to think of myself as frugal. There are ways to read without weeping over your budget. The library is, of course, the one place you can indulge in thrifty reading. If you live in an urban setting, you have many libraries at your beck. I am regularly delighted at titles available in our small town library. The fastest growing segment of our library is audio books. Before we take a trip, we cruise through the library to see what we can hear. Inter-library loans are another source of free reading. At my library a small charge for postage keeps IL loans out of the free zone, but they are still a frugal option. Make friends with book collectors who generously lend their collection. If you do this, keep borrowed books segregated from your own books. The best friend is one who returns a borrowed book in the same condition it was lent. Check to see if your library has free downloads of audio books. The Oregon Library System employs Library2Go enabling patrons to download thousands of titles from their home computers. Open Library is a work in progress, with the goal of a web page for every book published. Librivox provides free audiobooks from the public domain. These books are narrated by volunteer readers. Some are better than others. Amazon Kindle has free books available to download. Google Books (go to Google and click on the tab “more” for Books) has many ebooks available. Check on each title. 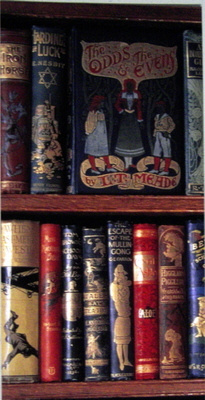 Project Gutenberg has 33,000 books available to download. 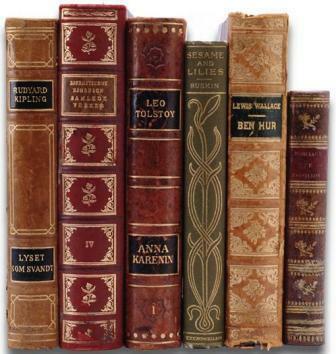 Page by Page has classics available for free, as does Forgotten Classics; JustFreeBooks is a search engine for free books. Bloggers often have drawings for free books. Saturday Review of Books at Semicolon and Books and Movies often keep track of book giveaways. If you write a book blog and build a following, you can receive free advanced review copies of books from publishers to read. This one sounds weird and manipulative…but! When you volunteer to help friends move, they often consider it a favor if you take some books off their hands. This is not why you offer to help! Same principle applies when helping at a garage sale. Often books you receive are not books you are interested in reading. 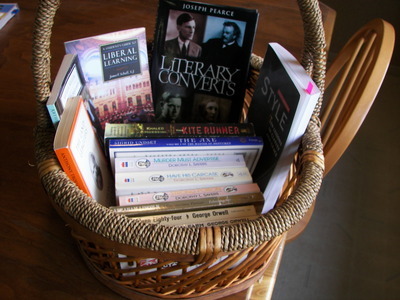 They may be great for trading or swapping to get the books you want to read. It is shameless of me to mention this. Let’s discuss the down side of free. One drawback from borrowing books is that you can’t write in them. No really, you can’t. I hope you don’t dog ear any book, but you mustn’t do that to library books. You also have a fixed time to read the books, renewals notwithstanding. Reading on a screen instead of from a page may or may not be your cuppa. Some Kindle readers have noticed that they read more mediocre books simply because they were free. I have never pursued free review books from publishers because they would delay me from imbibing in my tottering stacks. The books are free, but not free from obligation. Nevertheless, there are endless possibilities for free books. Library sales are the best place to find books on the cheap. Book Sale Finder. Garage sales, yard sales, tag sales often have books. In our area hardbounds cost $0.50 and paperbacks $0.25. 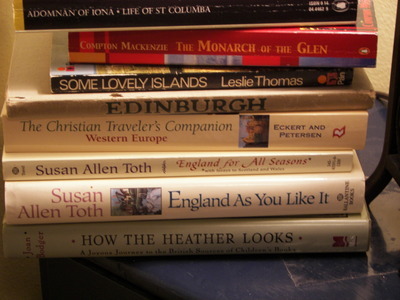 Thrift stores are another source for bargain books. Once a month a book scout friend of mine would drive a 350 mile loop, stopping at thrift stores – Salvation Army, Goodwill, etc. – looking for books. For him it was a lucrative hobby to pick up books for 25¢ and sell them for between $10 and $100. But the thrill of the chase and the expectation of finding treasure was what propelled him. Some of the best times we had in Great Britain were popping into thrift shops looking for books. I got so I could snift an Oxfam from a mile away. What confused me is that thrift shops are named for the charity they benefit. The first time I saw a store called British Heart Foundation I couldn’t imagine what they sold. 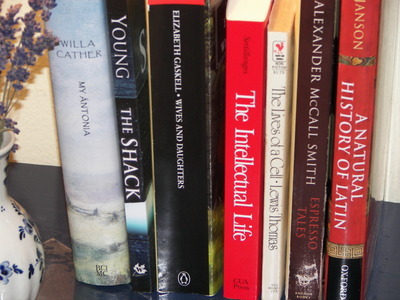 Used bookstores provide a living for their owner, so their prices are necessarily higher. Still, they have their clearance racks. The cleaner and better organized the store is, the more you will pay for the books. If you are willing to dig through piles and stacks and dust bunnies, the slovenly, slightly smelly book shop may reward your efforts. My favorite chain of used bookstores is Half Price Books, for its large inventory, excellent organization, and pure fun. ISBN stands for International Standard Book Number. Think of it as a social security number for books. or near the bottom of the copyright page. When searching online for a book, it is very helpful to have the book’s ISBN. You can put this 10- or 13-digit number in the search engine. And where to look online? At amazon.com there are hundreds (and hundreds!) of used books selling for $0.01, which means that the books will cost you $4.00 after $3.99 is added for shipping. Still. I’ve done eye calisthenics that train my eye, whenever searching Amazon, to roam to the right column which says Used From, looking for a bargain price. But here is another way to find the cheap books on Amazon. It’s a fun experiment! Click on amazon.com . [Books, Advanced Search, Condition:Used, Format:Printed Books, Sort Results By: Price: Low to High] Click on Search and you will see pages of $0.01 books. Ebay.com and half.com have oodles of books for sale. On the home page of half.com there is a category for $0.99 or less books. Overstock.com sells books and shipping is always $2.95. After you click on the category of books to browse, sort by Lowest Price. If you are looking for a specific title or specific author you don’t need to browse; use the search button. The down side of browsing for cheap books is that it is very time-consuming. And you have to wade through pages of titles you are not interested in. I prefer to keep a list of books I would like to read and look for specific titles. Like browsing in a bookstore, you may come across the occasional winner. 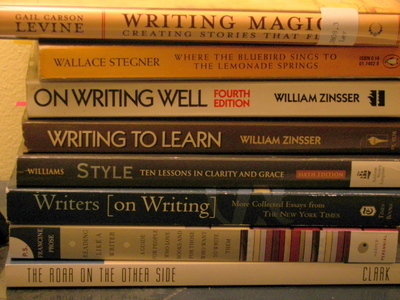 Search engines specifically for books can help you find the best bargain. The first one I used (and thus know best) is fetchbook; others are BookFinder, AddALL.com, Usedbooksearch. When I homeschooled I always checked the availability of used books before I bought new. One quarter I took my son’s college textbook list, plugged in ISBNs and bought used textbooks at a great savings. Another splendid source for books is swapping. I am a huge fan of Paperbackswap. It’s an easy concept: you post books you no longer want; when another member requests a book, you mail the book to that member; when that book lover receives the book, you get credit for one free book. Thus the cost to you for your free book is the cost of the postage to mail the book you didn’t want, normally $2.41. I’ve been singing PBS praises for years now. [And it would be silly of me not to mention that if you decide to sign up for PBS, please click on the icon above. I am Carol B. and my nickname is ilovetolearn.] Paperbackswap (unfortunately, the name wrongly implies that we don’t swap hardbounds: we do) is only a good deal if you don’t have post office phobias or procrastination tendencies. You can print out most of the postage and mail from your home. Patience is a virtue; put a book on your wishlist and you may receive it in two weeks (if it is available) or perhaps in two years (if it is an obscure title, or one so popular that you are in line behind 514 other readers, like I am with the book Outliers). Book Mooch runs along the same plan as PaperBackSwap. The down side of swapping is that you don’t get books as soon as you want them. And you could post 20 books that others want and have to pay $50 in postage mailing out the books. To be a successful member you need to be organized enough to get the books mailed when they are requested. 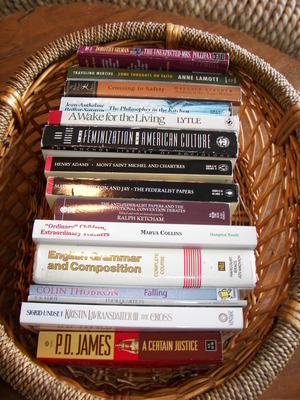 So there you have it: several ways to score cheap books and satisfy your need to read. I’m sure you have other ideas…I’d love to hear them. Happy Reading! This entry was posted in Uncategorized and tagged booklists, frugal, reading by alivingpencil. Bookmark the permalink. Great post, Carol. Thanks to you I’m a big PBS fan too. Thrift stores aren’t as fun as they used to be since “someone” at Goodwill seems to know about books and is posting the better ones for sale on the internet. I mostly use the library and the one cent books at Amazon. And, of course, PBS.By the way, I just finished my fourth Hassler book on Agatha McGee (chronologically #3) and it was my least favorite of all. Maybe I’m growing out of my “Miss McGee phase”. Now I’m off to read “My Dear Friend”, the letters of Abigail and John Adams. Excellent ideas! Don’t forget that you can always ask for books for birthdays, Christmas, etc. If you are ever in Huntsville, AL, be sure to visit Booklegger. Hyde Bros. in Fort Wayne, IN, is my all-time favorite used bookstore, though. It’s amazing. They even have a cat. I was drawn in by your title. “Extravagant” is the word I frequently use when we go to the library, too — I can say “yes” to whatever the girls want to throw in the cart and don’t have to worry about cost.Great post. What a wonderful post! I am going to look into PBS. Also, many libraries have bookstores set that they sell books all year round. Hi Carol,I guess that all us bookaholics have the same problem, the constant need to acquire more books, yet once we have them there can never be enough days in a lifetime to read them all? ?I don’t tend to use libraries as much as I should, as I can never stick to the return schedules. Most of my supplies come from the many high street charity shops, where I just can’t resist.My TBR pile is so large that I have been put on a book buying ban by my long suffering husband, unless of course I can sneak one or two in unseen! !I never read a book more than once, then it is always passed on to someone in my circle of like minded friends and family, oh dear! more new stock from swaps!! My favorite used-book site is http://www.abebooks.com. When you search for a book there, you are searching the inventory of thousands of used book sellers all over the world. This site is especially valuable to me because so many of the books I grew up with were never published here in the U.S. I can do a search and find a copy of an old treasure for $1 or $2, and then even with international postage it’s not unreasonable. I always look to see if there’s a copy available in the U.S. first of course! That’s how I got my copy of Auntie Robbo, which I am currently reading to my youngest kids. I was so confused about what to buy, but this makes it unasertdndable.